Tremendously gifted, Mary Lou Wiliams fully deserved the status of "First Lady Of Jazz". She begins the piano very early by rubbing against popular rags and songs of the twenties, and she quickly built a reputation among the greatest jazzmen from that time. 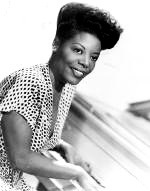 She was also a talented composer and arranger who worked with Benny Goodman and Duke Ellington. His style evolved with the arrival of bebop, and Mary Lou worked with young and promising musicians such as Thelonious Monk et Dizzy Gillespie. As the first female solist to join the ranks of jazz legends, she inspired respect from his peers throughout her career.